Welcome to Sky People Higher Education! We’re glad you’re here. Northern Arapaho Chief Black Coal was born in 1840. He became known as a fierce warrior but while still a young man, he went to Carlisle Indian School, where he learned to speak English. He also served as a tireless scout, but his dangerous scouting days came to an end after he lost three fingers and part of his right hand in a skirmish. Black Coal gained stature as a tribal intermediary during the many conflicts of the 1870s. He was a respected leader and later the main Northern Arapaho Chief of his tribe. 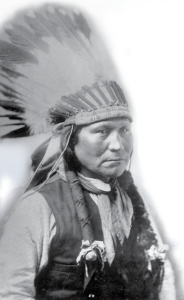 Chief Black Coal kept most of his warriors out of the fighting along the Bozeman Trail. In clashes with the U.S. Military, he counseled his people not to engage in war but to seek peace instead. Black Coal was eager to learn yet he retained his Arapaho teachings. He enjoyed visiting classrooms where he spoke in English and Arapaho. He wanted all the children in his tribe to learn to read and write in English. For the most part, Chief Black Coal was able to keep his warriors at home, but after the Sand Creek Massacre in 1864, in which many Arapaho women and children were killed, some of his warriors broke away. They joined the Lakota and Cheyenne who fought Lt. Col. George A. Custer in the Bighorn Battle of 1876. After converting to Catholicism in his later years, Chief Black Coal died in 1893 and was buried in the rocky ridges near St. Stephens Mission in Wyoming.